For my last economic update of the year I will review where we are today and try to read the tea-leaves of the incoming Trump administration. The president elect is lucky in inheriting a solidly growing economy. His penchant for decisive action may run into procedural roadblocks in Washington which could significantly delay actions which require congressional approval. Overall I see few significant effects in the coming months. 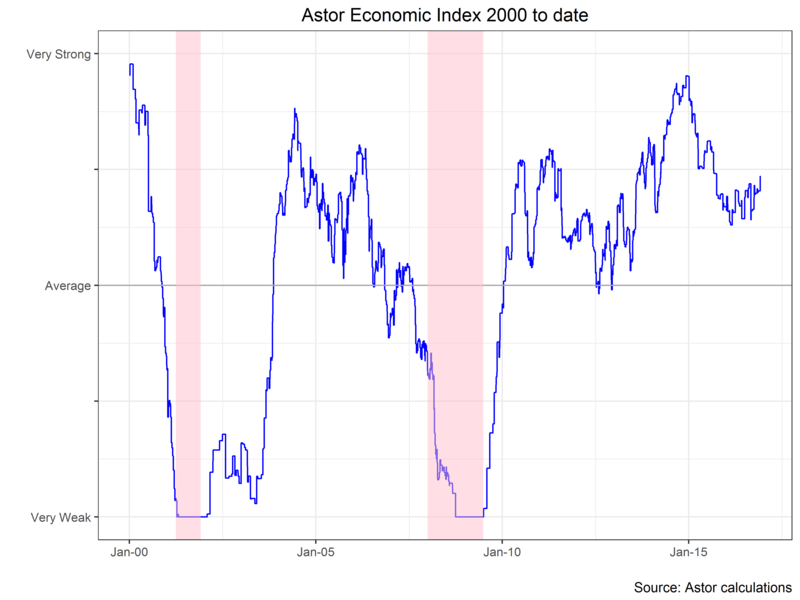 Our latest reading for the Astor Economic Index® (“AEI”) improved over the month and currently shows the US economy as growing somewhat above average. I also see modest improvement year over year. As this is the last update of 2016 I can say that I am pleased with the performance of our index as an economic gauge over the last 12 months. Memories may be dusty, but a year ago there was widespread concern about US economic weakness. The AEI was showing only minor declines at the time and, in fact, no extended decline in the broader economy occurred. The AEI is a proprietary index that evaluates selected employment and output trends in an effort to gauge the current pace of US economic growth. The new president’s first element of luck is an economy running at full employment. Last Friday’s employment report was fairly strong – showing the economy continues to add jobs faster than the number of new entrants to the work force. Levels of both unemployment and underemployment (ie, involuntary part time work) have both dropped significantly in recent months. Recently we have seen a trend of improving wages. That trend weakened slightly this month but the year on year improvement is still significant. The nowcasts produced by the Federal Reserve banks of Atlanta and New York are both still showing strong growth in the fourth quarter. The Atlanta Fed is currently estimating 2.6% SAAR and the New York Fed is currently forecasting 2.7%. Both somewhat above the average for the current expansion. Both estimates have been updated since the release of the employment number for November. There is another element of luck in the external environment – what is going on with our trading partners around the world. 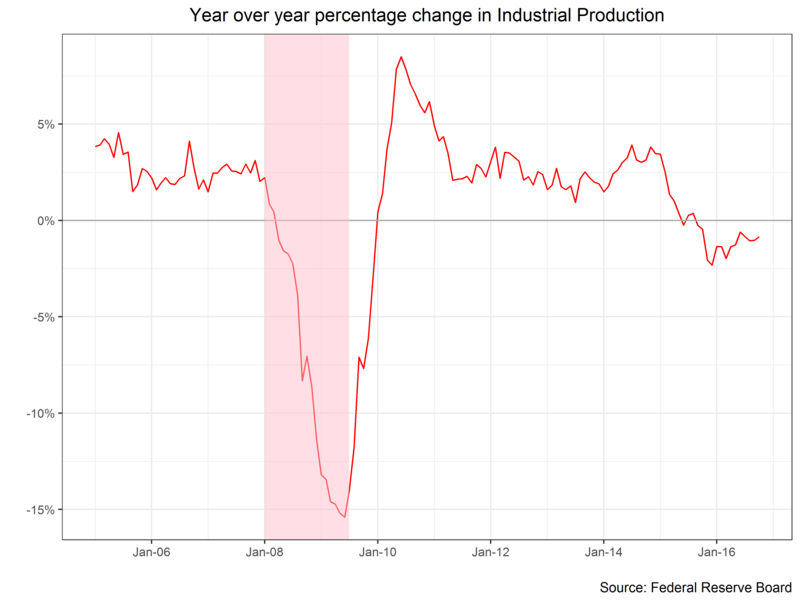 I attribute the last few years tepid industrial production growth to weak external demand and the strength of the dollar. 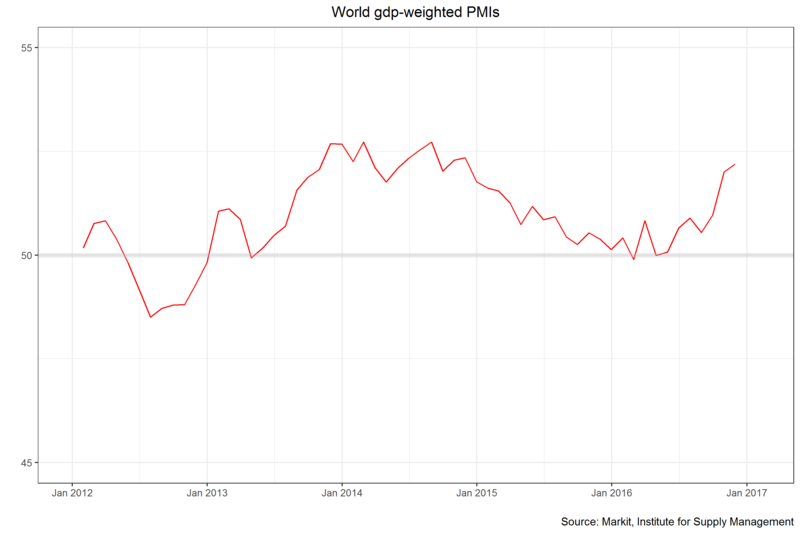 The chart below is the GDP weighted average of the individual purchasing managers indexes. I intend it to be proxy for the change in demand in the world manufacturing cycle. This reading is now approaching its highs from 2014 – suggesting that the weak global manufacturing environment may be improving. Mitigating this global good news somewhat is the performance of the dollar which has set new highs in trade weighted terms. This makes it harder for business to export, though dollar is not seeing the sharp rise it experienced in June 2014- December 2016 period. The contours of economic policy under the Trump administration have yet to be fully fleshed out. One interpretation of the market action since the election is that there is a substantial likelihood of fiscal stimulus in the form of tax cuts and perhaps infrastructure spending. The President will need to negotiate with both the House and the Senate which have different priorities than does the President Elect. Additionally the GOP holds only slim majorities in both houses, increasing the chance for a small number of legislators to derail the process – at least temporally. If the normal timetable holds we will not see a budget from the new administration until February and House and Senate budgets until March. The negotiation process will then begin. This gives plenty of time for the markets to be disappointed by what may turn out to be an unusually public negotiating style. The morning after the election I noted that the president has much more autonomy in trade policy. I feel that my comments are still germane: unlike in fiscal policy, the President is able take unilateral actions which may sound like the first shots in a trade war. Combine fiscal policy with trade policy and era of Government By Tweet may offer plenty of examples of what my bond trader father used to call Tape Bombs. These are shocks in the form of unexpected, inherently unpredictable pieces of news which the market reacts and over-reacts too. Recall the summer and fall of the debt ceiling to get a sense of what I mean. At Astor we think that in times like these is even more important to approach the markets with a discipline which clarifies decision making by keeping the focus on facts not predictions. In our case we will continue to use the state of the of the business cycle as it unfolds as our key input in making investment decisions. Closing with the fed, my judgement and that of the fed funds futures market (which has a conventional interpretation, see this CME page for example) is that the FOMC will raise rates at the next meeting. Using the same interpretation of the fed fund futures curve shows that the market is expecting another hike or two by next year, though the market has been repeatedly disappointed in the last several years. Two things which could make the fed hike more quickly than the market expects would be a sustained rise in core inflation or the prospect of substantial fiscal stimulus. Keep on the lookout for comments by fed governors making the connection between the monetary and fiscal stances of the US. Overall the economy continues its recent path of modest growth. With some headwinds dissipating we may be hope that next year will be on the upper end of the recent range of growth. As always we will continue to monitor the economy closely.